Extreme floods have become more frequent in the Amazon Basin in just the last two to three decades, according to a new study. More here. Amazon River, Western Para Province, Brazil June 1996. This image shows the flooded condition of a small section of the Amazon River,including the jungle towns of Obidos and Oriximina. The sun’s reflection off of the muddy looking river water, called sun glint or sunglitter, helps to identify land-water boundaries in this section of the Amazon River which is roughly midway between Manaus and the Amazon River Delta. By comparing this image to a detailed map of the area it is obvious that the river is flooding in the low lying areas that are adjacent to the floodplain of the main channel of the river. Large areas south of the main channel of the Amazon River are covered by standing water. Patches of cleared land can be identified within the densely vegetated terrain along the northeast side of the Amazon River. 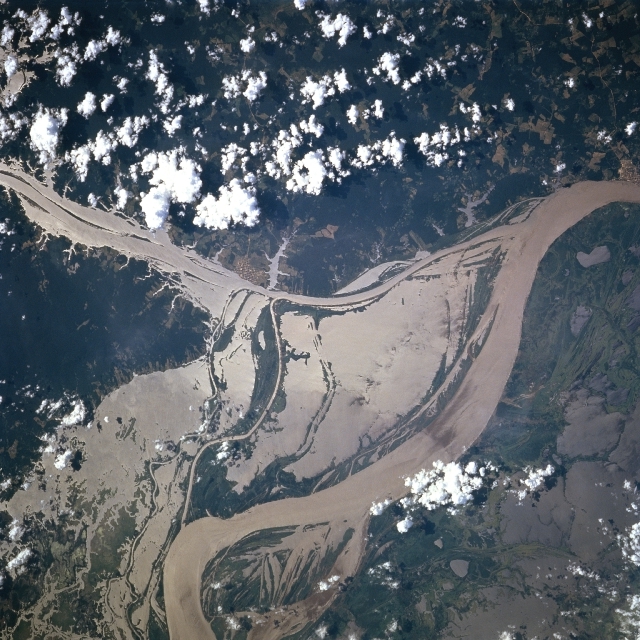 The main channel of the Rio Trombetas can be traced southeastward from the right edge of the picture until the river merges with the Amazon just west of the small jungle town of Obidos. Satellite image by NASA.